Explore presentations, directives, and committee rosters, and sign up to participate. We're setting a high goal for ourselves — to make freedom and learning a way of life. The path to that goal is to have every student who chooses to attend Mason come to realize that this is one of the best decisions they've ever made. George Mason University students, faculty, and staff convened in fall 2016 to discuss a new initiative: the Student Experience Redesign Project. 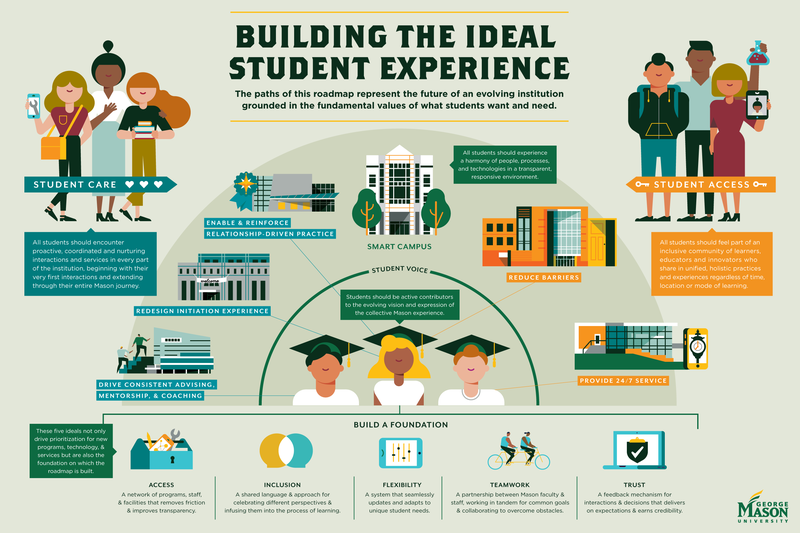 This effort sparked fresh conversations across the university about what the ideal Mason student experience should include. Surveys, interviews, and data analysis enhanced the initial dialogue, which evolved into task forces that built action plans. These plans will be central to the evolving vision and expression of the collective Mason experience. In the ideal university culture, students should experience a harmony of people, processes, and technologies in a transparent and responsive environment. This means that our path forward will include smoother student interactions with services such as enrollment, registration, and housing. Students will feel more personally involved in their interaction with the scholarly process through consistent instruction, advising, and mentorship. They'll feel a strong connection with the Mason community, not only through special events, but through their every interaction with the university environment. Student Care: All prospective and current students should experience proactive and nurturing assistance from Mason via consistent, coherent, and coordinated interactions, services, and contact points across the institution. Student Access: Regardless of field of study, location, time, learning path, or desired degree level, all students should have access to and feel part of an inclusive, transparent community of scholars, educators, and innovators united by a holistic, modern, and shared experience — what makes Mason, Mason. Student Voice: Students should have an active and vibrant voice in shaping and contributing to the evolution of Mason's shared experience, its expression, and its evolving vision. In February 2017, participants reconvened for a day-long retreat on campus to derive action categories from extensive research conducted in the prior six months. The more than 200 stakeholders from across the university identified six working groups the goals which will directly and positively influence the student experience. As these cross-functional teams have been defined, they've started working to build goals and form action plans. Each progressive year will include analysis, evaluation, and adjustment according to feedback from students about the quality of their experience. This ongoing discipline will help us better deliver students' needs, wants, and expectations. Mason's multidisciplinary approach allows students to interweave interests from outside their intended degree path to build a more customized and dimensional experience. The undergraduate experience poses new challenges for many students. As we improve the student experience at Mason, we will address these challenges in ways that personally engage students to prepare them for the future. Outside of the classroom, the Student Experience Redesign Project will examine and reconfigure students' opportunities to interact with the university community. A positive extracurricular experience is irreplaceable in terms of soft-skill development, wellness, and student retention. We're here for the students. We're here to guide them through their university path, foster their professional and personal development, support them in difficulty, and celebrate their achievements. In doing so, we honor our calling to be a university for the world.